There is plenty of bad news happening all around us. Fires in California, political vitriol, mass shootings, political lies and posturing, racial tensions spurred by racist groups and individuals, silencing and reprimanding of legitimate media, and so much more. So I'd like to focus on some moments of gratitude that I've seen in my life in the past week in the hopes you will reflect on some that may be in front of you. 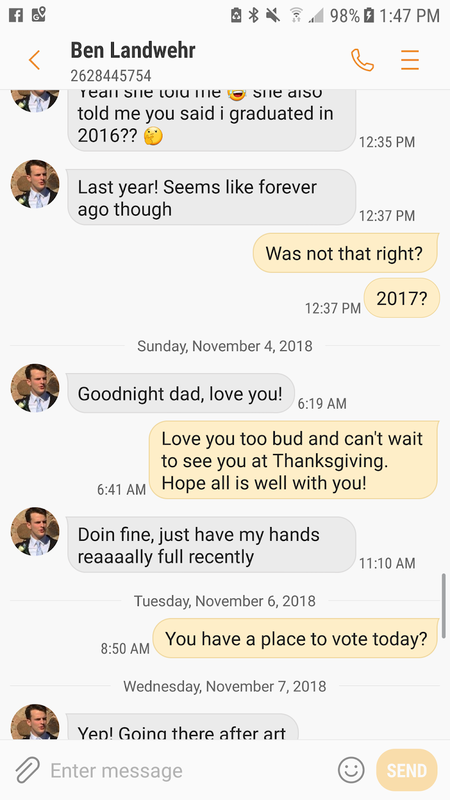 My son, a sophomore at UW Madison, randomly texting me "Goodnight dad, love you." Four words. The best four words of the day in this case. It only takes a minute to do this for people. I regularly do it to my kids as well. A half hour phone call with my mom, who's 85. Trust me when I say I don't take this privilege for granted. We talk about what's new in her life, how my kids are doing and what's coming down the road for the holidays. We end every call with "Take care. I love you." I'm 56, but it feels as good saying that as it did at 14. Enjoying going into work as a supervisor of three cool, competent, hard working staff members. I'll be honest, this was a transition I was highly worried about. After the initial three months of chaos and disruption, I am as happy as I've been at my job in 15 years. A quiet library and three hours to write. To turn on my music, dive into my head and escape all the problems of the world. This is my "television escape" without the TV. Having a guy who's new to the area show up for beers with boys night last Thursday. He stepped into our lives because he'd heard about our church from his daughter. A nice guy on a spiritual journey, looking for more than church was giving him. Looking to meet some friends. Looking for space to share his story. Hopefully he'll come back and will connect with us. Having two different writing colleagues contact me during the week, one for advice, one to say they miss me in class. My communities are many and I appreciate them all. Watching a Vietnam veteran struggle with his emotions while reading from his novel based on his stay of service over 40 years ago. Everyone in this world is fighting a battle. Be kind. 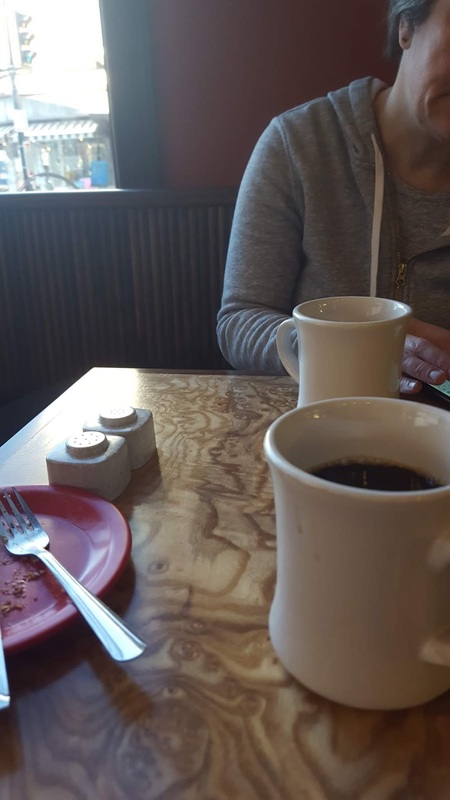 Coffee with my spouse every Saturday morning. We go to a local coffee shop and see all the regulars there every week. The woman lovingly toting her two year old and her infant for an hour of mothering and coffee. A couple of longtime friends complimenting my poetry chapbook, On a Road. The book was written about them and a road trip we all took. Fond memories of long ago. 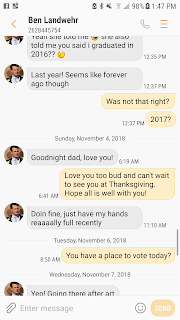 Supportive words from people I connected with closely for a short period of my young life. Blessings in my long life. Coffee with three close buddies on Thursday mornings. We talk through our lives, the ills of the world, Jesus and his goodness, mechanical engineering, politics and auto maintenance. Sixty minutes of streaming consciousness that helps ground me. I hope these simple moments I noticed help you see the beauty and goodness in your own world. If we dwell in negativity, evil and despair it drags us down. Life is short. Don't waste it in worry and nonsense. Look around. Be grateful. Give back. Love.